"I bought this dual keystone plate so that I could put different connectors in each socket (RJ45 in one, and F-Type for TV in the other). 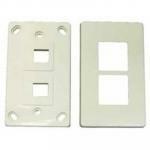 So although it says in the product name that this is a "dual..."
Dual Port RJ-45 Keystone Face Plate - 2 piece. Horizontal Mount. 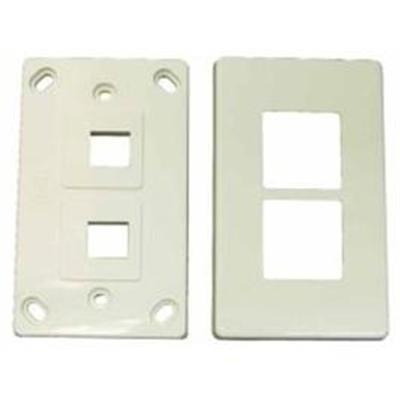 I bought this dual keystone plate so that I could put different connectors in each socket (RJ45 in one, and F-Type for TV in the other). 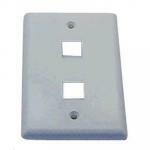 So although it says in the product name that this is a "dual port RJ45" plate, it actually works well with any keystone compatible socket. 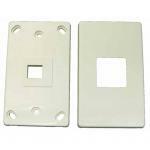 Having the separate cover means the finished result is very tidy.I bought this dual keystone plate so that I could put different connectors in each socket (RJ45 in one, and F-Type for TV in the other). 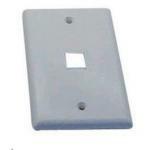 So although it says in the product name that this is a "dual port RJ45" plate, it actually works well with any keystone compatible socket. Having the separate cover means the finished result is very tidy. 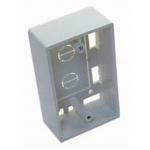 ITPFPC6002 Dynamix FP-C6-002 Cat6 Keystone RJ45 Jack for 110 Face Plate . T568A/T568B Wiring. 90 Jack. Jack. 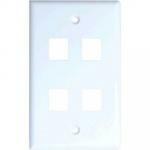 ITPFPC6007 Dynamix FP-C6-007 Cat6 Keystone RJ45 Jack for 110 Face Plate. T568A/T568B Wiring. 180 Jack. PB Tech price: PB Tech price: $3.72 ex. $4.28 inc.